Buying a diamond in the 21st century is completely different than 30 years ago! Before, you could walk into a mom and pop jewelry store and pick out a ring from the case that was finished and completely ready to walk out the door with it. Although we have some like this in most cases your ring is going to involve a little more work. Now that we live in what I like to call the “customization age” walking into a jewelry store to pick out an engagement ring is completely different. Now you have ton’s of ring mounting options that require a loose stone to be set in the center, this may include a diamond or you may go the alternative route and pick a colored stone like morganite. To help you better navigate the rough seas of buying an engagement ring and making sure you get exactly what you are paying for here are a few tips! If you walk into a store that you don’t feel comfortable in, a store that isn’t friendly, open, and ready to assist you with your purchase… WALK AWAY NOW! Buying the ring is just the beginning, finding a store that will be with you for the next 50 years is key. A diamond guarantee or what some places like to call their “Warranty” is so important! This little slip of paper ensures that they are going to take care of you if anything happens to the ring. Normal wear and tear will happen, just like on a car, but if you keep your ring checked and cleaned every four months Robinson’s is going to have your back if a stone falls out. We guaranteed that stone for the next 4 months and if it doesn’t stay in during that time and we see that there wasn’t a structure altering situation that made it fall out… we are going to take care of it. Before buying a loose diamond educate yourself enough to know what the consultant is saying to you. Clarity ranges from Flawless to Included. Flawless being the clearest stones and included being full of inclusions. Because diamonds are formed deep within the earth, under extreme heat and pressure; virtually all diamonds contain “birthmarks”; small imperfections inside the diamond (called inclusions), or on its surface (called blemishes). Clarity refers to the degree to which these imperfections are present. The Color refers to exactly what it sounds like… the color of the diamond. Diamonds are graded on a scale from D to Z. D being in the colorless category and Z being in the light yellow category. The cut of the diamond is one of the most important things to look at. The way a diamond is cut will determine how the light is going to reflect from the stone. If the stone is too shallow the light is going to go in and bounce down. A diamond cut too deep will have the effect of the light reflecting to the side (which will be covered up by a mounting). 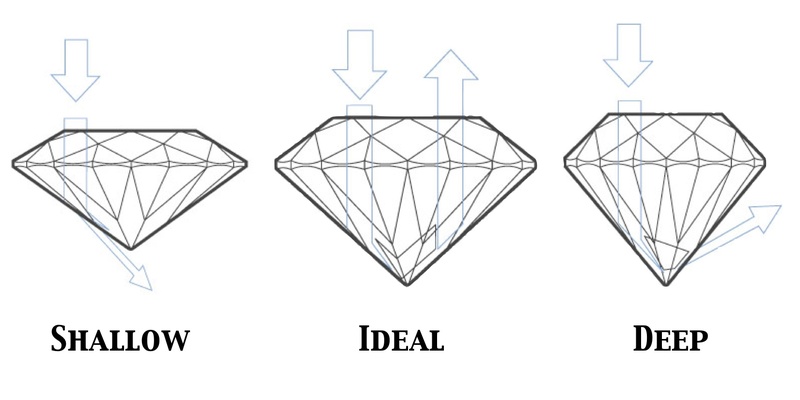 With all that being said the Ideal cut diamond is really the only cut diamond you should be purchasing. The ideal cut is cut so the light reflects up to the surface and gives the the diamond that really bright and sparkly look that all girls want to see! At the end of the day you need to pick the stone that is the most beautiful. With cut, clarity, and color set aside pick the one that appeals to you the most. I have seen it happen over and over again. We put two stones out to show you. On paper stone 1 is said to be the the higher color, cut, and clarity than stone two. But stone two just has that something special, the extra sparkle, sometimes we don’t know what it is.. but it is better! Go with your gut, and get the stone that you love the most!